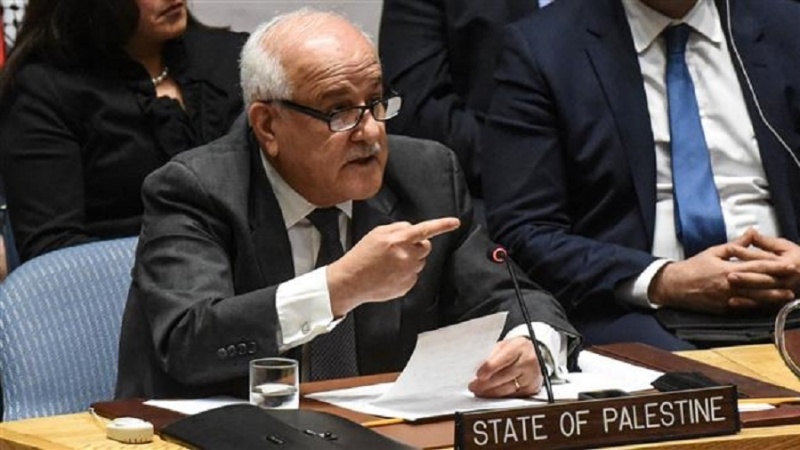 Riyad Mansour made the remarks on Wednesday while addressing an emergency session of the Security Council called by the US over the recent flare-up of conflict in the besieged Gaza Strip. Israeli tank fire and airstrikes hit Gaza on Tuesday. The Tel Aviv regime said its assault came in response to a barrage of rocket and mortar rounds fired at the occupied territories. UN envoy for the Middle East Nickolay Mladenov warned the council that the flare-up of the conflict between Palestinians and Israelis in the Gaza Strip may result in war. “This latest round of attacks is a warning to all of how close to the brink of war we are every day,” he said. “No one in Gaza can afford another war,” he added. France warned the council that the failure to agree on a response to the Gaza crisis was damaging to the United Nations. “This increasingly heavy silence, which is becoming deafening, is not acceptable,” said French Ambassador Francois Delattre. “It is not acceptable for the Palestinian and Israeli populations who are affected by this conflict. It is not acceptable for the world that is watching us,” he added. The United States called on the UN body to condemn Palestinian rocket attacks but the move was blocked by Kuwait, which argued that it had presented its own draft resolution that addressed the situation. Israeli regime conducts regular air raids on Palestinians in Gaza under the pretext of hitting Hamas targets. The Gaza Strip has also been under an inhumane Israeli siege since 2007.